Understanding the processes that control the formation and ultimate loss of such relativistic electrons is a primary science objective of the Van Allen Probes and has important practical applications, because of the enormous amounts of radiation trapped within the two Van Allen radiation belts. The belts, consisting of high-energy electrons and protons discovered above the Earth's upper atmosphere in 1958 by James Van Allen, can pose a significant hazard to satellites and spacecraft, as well to astronauts performing activities outside a spacecraft. Such electrons in the Earth’s outer radiation belt can exhibit pronounced increases in intensity, in response to activity on the sun, and changes in the solar wind — but the dominant physical mechanisms responsible for radiation belt electron acceleration has remained unresolved for decades. Two primary candidates for electron acceleration exist, one external and one internal. From outside the belts, a theoretical process known as “inward radial diffusive transport” has been developed; from within the belts, scientists hypothesize that the electrons are undergoing strong local acceleration from very low frequency plasma waves. And controversies exist as to the very nature of the wave acceleration: Is it “stochastic” – that is, a linear and diffusive process – or is it non-linear and coherent? The top panel shows electron fluxes before (left) and after (right) a geomagnetic storm. 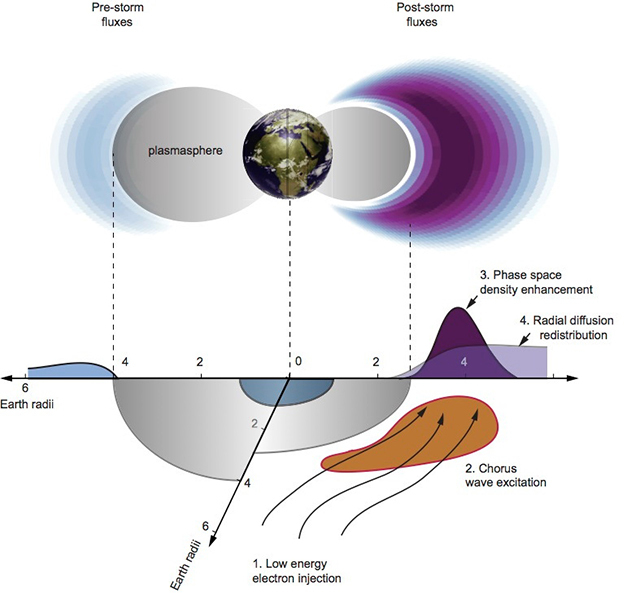 The injection of low-energy plasma sheet electrons into the inner magnetosphere (1) causes chorus wave excitation in the low-density region outside the cold plasmasphere (2). Local energy diffusion associated with wave scattering leads to the development of strongly enhanced phase space density just outside the plasmapause (3). Subsequently, radial diffusion can redistribute the accelerated electrons inwards or outwards from the developing peak (4). In research published Dec. 19 in Nature, lead author Richard Thorne and colleagues report on high-resolution measurements, made by the Van Allen Probes, of high-energy electrons during a geomagnetic storm of Oct. 9, 2012, which they have analyzed together with a data-driven global wave model. Their analysis reveals that linear, stochastic scattering by intense, natural very low-frequency radio waves known as “chorus” in the Earth's upper atmosphere can account for the observed relativistic electron build-up. The detailed modeling reported in Nature, together with previous observations reported earlier this year in the journal Science of peaks in electron phase space density by Geoff Reeves (radiation belt scientist at Los Alamos National Laboratory in New Mexico) and colleagues, demonstrates the remarkable efficiency of natural wave acceleration in the Earth’s near space environment, and shows that radial diffusion was not responsible for the observed acceleration during this storm, said Thorne, a distinguished professor of atmospheric and oceanic sciences at the University of California at Los Angeles (UCLA). The local wave acceleration process is a “universal physical process” and should also be effective in the magnetospheres of Jupiter, Saturn and other magnetized plasma environments in the cosmos, Thorne said. He thinks the new results from the detailed analysis at Earth will influence future modeling of other planetary magnetospheres. The successful point-by-point inter comparison of radiation belt features observed by the Van Allen Probes with the predictions of the state of the art model developed by Professor Thorne and his group dramatically demonstrates the significance of in situ particle acceleration within the Earth's radiation belts," says David Sibeck of NASA's Goddard Space Flight Center, Van Allen Probes mission scientist. Co-authors of the new research include Qianli Ma, Wen Li, Binbin Ni, and Jacob Bortnik, UCLA; and members of the RBSP-ECT and EMFISIS science teams on the Van Allen Probes. The research was funded by the NASA, which launched the twin Van Allen probes in the summer of 2012. The Johns Hopkins Applied Physics Laboratory in Laurel, Md., built and operates the probes for NASA's Science Mission Directorate. The Van Allen Probes are the second mission in NASA's Living With a Star program, managed by NASA's Goddard Space Flight Center in Greenbelt, Md. The program explores aspects of the connected sun-Earth system that directly affect life and society.